"This extreme plethora of homonyms in Japanese handicaps Japanese speech communication further. The more Chinese loan-words the speaker uses, the more he must pause to either verbally or pictorially (on a blackboard or palm of his hand) distinguish the word he is using from numerous homonyms. This method...detracts from the elegance and flow of the spoken language." Becker, C. B. (1986). Reasons for the lack of argumentation and debate in the Far East. International Journal of Intercultural Relations, 10, 75-92. Often what is very useful for Japanese presentations, especially smaller, more technical situations, is a white board. This way the presenter can write a key term in kanji when necessary. Some of the better presentations I have seen in Japan have been ones where the speaker simply used the white board from time to time as his talk progressed. But what about the "death-by-PowerPoint" type of slide presentations? 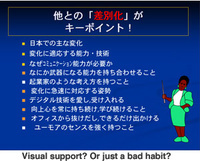 Because of the nature of Japanese language, isn't a lot of Japanese text in a slide helpful? Yes, if limited to a word or two or a very short sentence, or a quote. The key is to keep it visual. If our slide has long Japanese sentences, then we are asking the audience to listen and read at the same time, something we should avoid since we are there to talk, converse, and connect. But if we are talking about a word or two in Kanji, for example, then this can be good visual support. This is true even for English, but especially true for short burst of display text written in Japanese (even with kana scripts) and Chinese given the visual essence of the script itself. Japan is a very visual culture. Some of the greatest graphic design, for example, is from Japan. The written language itself is pictorial, so how did we end up with so many boring text-filled "visuals" in Japanese business and academia? There are many reasons, but two I have touch on above. The first is that the PowerPoint bulleted-list style was thrust upon Japan and the techniques absorbed from the West along with the imported software. More than anything else, it is simply habit now, reinforced by scores of "how to" Japanese presentation books that preach simplicity but encourage by example presenters to fill a slide with up to seven sentences of Japanese script. Secondly, the ambiguous nature of Japanese spoken language — which puts a lot responsibility on the receiver to fill in the blanks — can often be better understood if indeed supported by a display of written text. But, in my opinion, the positive influence of such supporting display text is greatly reduced (or negated completely) when a presenter places too much text on the slide. What is too much? Anything more than a simple Japanese term, phrase, short quote, or brief bullet list is too much...even in Japan. Below are two examples. The one on the left would not be unusual in Japan (though the content may be). The slide on the right is more of a "Presentation Zen" approach — simple, visual. 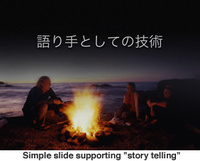 The Japanese in this slide says "The Art of Storytelling." I could use this slide when I talk about how marketing is really about the stories we tell, or how presentations are in essence about storytelling and connecting with an audience to inform, persuade, or motivate, etc. Most people can relate to telling stories around a campfire...we do the same when camping in Japan. The slide can help the audience almost instantly get what I am talking about...and it can help them remember as well. While presenting in Tokyo the other day, the issue of cultural differences and presentation styles came up. There were essentially two questions: (1) is the "no bullet points" style of using highly visual slides with an engaging, warm, dynamic delivery appropriate in Japan? And (2) are there important cultural differences presenters must know before presenting in Japan? In my experience, Japanese audiences are indeed used to rather static, bullet-point-filled monologues. This is "normal." But when a Japanese audience does encounter someone who engages, connects, shows their personality, uses professional images while at the same time weaving their content into a logical story with evidence and support, the response is almost always extremely positive. So the answer to question (1) is yes, though of course every situation is different. This bring us to question (2), are there things foreign presenters should keep in mind when presenting in Japan? Yes, there are. In future I will touch on some of the issues in greater detail, but perhaps the biggest difference between a Japanese audience and an audience comprised of, say Australians and Americans, is that the Japanese will be very reluctant to participate when you put questions out to them. There are many and varied reasons depending on the context. For example, younger members of the audience may be deferring to more senior members (Power Distance). Or perhaps the audience members have never met each other and therefore naturally hesitate to risk a mistake in front of such a group (Uncertainty Avoidance). The important thing is not to misinterpret silence or a lack of verbal feedback from your audience in Japan. In the West, a silent audience is often a bad sign — an indication that they did not understand, or they did understand but did not agree. You do not necessarily need to worry about an audience response that is more subdued than you'd expect in the U.S., for instance. An awkward situation foreign presenters get into in Japan is when they plan for audience members to participate and then get noticeably thrown off by the lack of involvement. For example, last year I attended a presentation where the speaker had counted on the last half of his presentation being a Q&A session. The problem was, after 1-2 questions volunteered from the audience (which took a lot of prodding), that was it. No more questions. The presenter still had a great deal of time left, was visibly surprise and bemused, and ended up concluding his talk early in a very uninspiring manner. A good presenter visiting Japan will do a thorough job of anticipating the questions first and then building those into the talk or into the Q&A time if the audience is indeed quite. 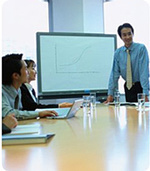 Consult with your Japanese counter parts if you need help identifying possible questions or areas where there might be pushback during the planning stage of your presentation. 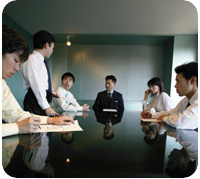 The Japan External Trade Organization (JETRO) provides a document entitled Communicating with Japanese in Business, a 35-page (pdf) document that provides a basic introduction to intercultural communication with Japanese. Venture Japan also is a website which offers a basic introduction to doing business in Japan and some discussion on communication and culture.